This life is a JOURNEY…. Our Home Group is a fellowship of young married couples. Recognizing the sacredness of marriage, leaders Scott and Connie Overstreet desire to be mentors through the transitions that come with marriage and children. Our group hopes to be one where relationships, discipleship and community are valued. The group meets after church on the second and fourth Sundays of each month. We have lunch together and then have a time of devotion and discussion. This could be anything from talking about the sermon or doing a group study. The size of the group has varied over the year. Right now we have seven couples. All are younger families, so we have young children filling the atmosphere with laughter, the babbling of little voices, and maybe the occasional cry. We find many interruptions in our busy schedules, but strive to keep a regular schedule and meet with whomever is able to come. This life is a JOURNEY and can have an awkward start. “I remember our first meeting of our new community group, each of us sitting with our own families, tentatively reaching out to other couples, fits and starts of conversations that barely rose above the din of small talk. I accidentally voiced my disagreement with Scott on a theological point -- that was so not the plan! First impression blown: Check. Our previous community group disbanded because our leaders started a new ministry at Summit. The group was made up of our siblings, long-time friends, and Kevin’s former youth pastor who has been such an influence that our oldest son is named after him. To say that starting that group was easy and natural is a laughable understatement. This life is a JOURNEY of goodness and difficulty. When David wrote the 23rd Psalm, he compared the valley of death to green pastures and quiet waters. As Christians we know there will be seasons of trial and seasons of joy, but none of us could have predicted how much we would see both extremes in less than one year of being a community group. We have celebrated pregnancies, passed dissertations, good health reports, births and job offers. We’ve also walked through valleys. Deacon’s grandmother passed. Scott’s mother had a stroke and lost the use of her legs. But the deepest, darkest valley came when little Daniel Wyman never woke up from his nap. This life is a JOURNEY and is better together. When others are there to encourage, uplift, and support each other, we find comfort and goodness. We thank God for each other and His peace through all. Kids are only preschoolers for a moment and they're only in elementary for a season. The time we have to influence a kid in children's ministry is limited. Every phase is unique. Every phase matters. What our volunteers do matter too.Throughout the month of August we are asking our members to "Say Yes". Say yes to a wide variety of volunteer positions available throughout our children's ministry. Here's the story of how college student, Tyler Overton, decided to "Say Yes"... Two years ago, after hearing there was a need, Tyler decided to Say Yes to volunteering in Summit Kids. "I love working with kids and have always felt comfortable with being camp counselor, teacher, and other things! I knew this would be the perfect way to give back and serve the church!" On Sunday mornings you can find Tyler with the elementary kids. They like to play games before they go to theater time to dance and hear a a message from the bible story. Tyler also teaches those lessons occasionally. Once the lesson is finished they head back to the classroom to go over the lesson through activities. They like to end the day with more games! "It's very affirming and rewarding to have relationships with the kids and be able to have them be able to show that they are still learning while being able to have fun!" In John, God calls us to love others as he has loved us. Tyler made the choice to serve others by Saying Yes. He is choosing to follow through with God's commands and lead our children. "To me saying yes means being willing to truly put others before yourself and serve wholeheartedly." If you are interested in saying yes, just like Tyler did email Matt Oberdick or follow the link see where you can serve using your unique talents and skills. In the summer of 2016 both Caleb & Kirbie decided to say yes after searching for an opportunity to serve at Summit and knowing there was a need for volunteers. On Sunday mornings Caleb & Kirbie volunteer as Elementary teachers. They start by welcoming each student as they come in and ask them what they have been up to. The class then heads to the theater for worship. After their lesson they review scripture and do activities to get the kid engaged with the lesson to finish out the morning. Kirbie especially enjoys "practicing her dance moves alongside the students as they worship the Lord!" Caleb & Kirbie made the choice to Say Yes together as a couple. As children's volunteers we can often make the choice to "say yes" to make an impact on children's lives but what we don't realize is God is working in our lives and moving through us through our service. If you are interested in saying yes, just like Caleb & Kirbie did email Matt Oberdick or follow the link see where you can serve using your unique talents and skills. At Summit Church, we believe gospel community is the primary context for discipleship, because discipleship happens best in life-on-life relationships. This is where Home Groups shine! A group of like minded young adults, lead by Kevin Babiak & Emilee Hayes, started meeting May of 2016 in an effort to follow through with Summit's beliefs in a gospel community. There are two things this group 100% agree on, Loving God and each other and FOOD! On Sunday evenings the group meets to enjoy each other company over a planned potluck style meal or a "bring your own meal" depending on the plans made the week before. After devouring dinner they gather to study books of the bible by using group devotions or video series, discussing John Piper articles or going through that mornings message. The evening ends with prayer requests & praises and committing to spend time with the Lord on behalf of each other. Not only does their group meet Sunday evenings, they also have taken a road trip around the metro to celebrate their one year group anniversary. This mini road trip included a visit to Pops, the Wheeler Farris Wheel, a Dodgers game, roaming around downtown OKC and a pool party. They also do a trip to Broken Bow in the fall, which they are currently planning for. Celebrating each others lives such as engagements, weddings, babies, going away parties and holidays hold a special place in each members heart. If there is one thing this group of believers lives out it's "community is the context of a disciple." They are all fully devoted to seeking community, living life together and striving to follow the commands in scripture. This group of young adults is committed to holding each other accountable and lifting each other up daily. At Summit Church, we believe gospel community is the primary context for discipleship, because discipleship happens best in life-on-life relationships. This is where Home Groups shine! Four years ago Tim & Kelly Lashar decided to lead a home group of like minded people at Summit Church in an effort to follow through with Summit's beliefs in a gospel community. They meet every Wednesday at a home in Norman. Their group is classified as a multigenerational group. In the past they have had college students and young adults looking for older/mentor type home group leaders. Tim & Kelly lead the group together. They use Todd's sermon response as their guide for discussion. The group also believes in Missional Living by participating in service projects like Food & Shelter, Angel Tree and others. Home groups are meant to not only to have people to study and practice what is discussed on Sunday mornings but also to create community. Home groups are where you know you can go and be fed but also feed into others. Having a group of people you know you can trust and lean on is life changing. This home group has been a consistent source of community for many couples. The Lashar home group is a group of people that believe in the mission of Summit Church, "Making Disciples for the Glory of God" This group is proof of living to glorify God in the way they love on each other, openly welcoming anyone to their group and loving and learning about our gracious Father in Heaven. Family Worship Night at Summit Church was an event geared towards providing the opportunity for the church to partner with parents, to encourage and equip parents, for parents to focus on their children without distraction and help parents take a step toward playing a more active role in their child's spiritual development. This was provided by giving parents the opportunity to worship along their children's sides, not only in the form of worship they are used to on Sunday mornings but also giving the children the opportunity to see how their parents worship on Sunday mornings as well. Not only was worship the main focus of the evening but also having some fun as well! 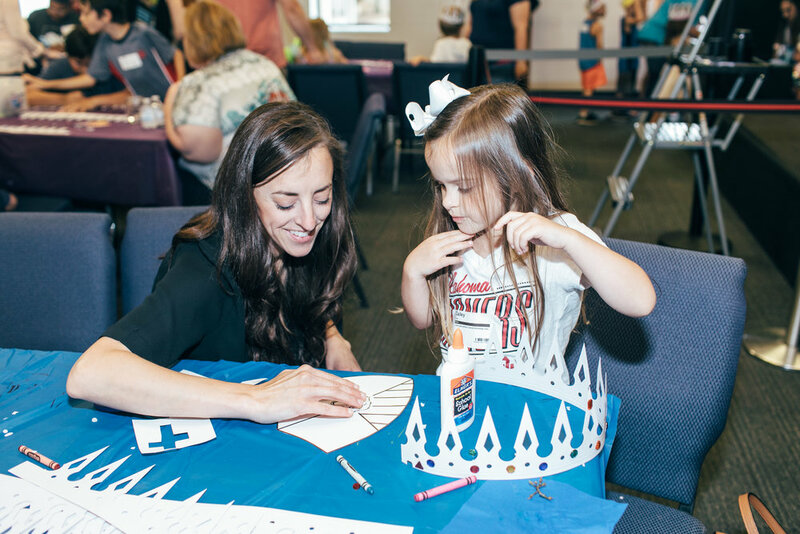 The evening allowed for parents to make a craft with their children, whether it was a prince or princess crown, a family shield or BOTH! Prizes were given out and fun was had by all! There was a chance to have your picture taken with your family in front of a castle too! There was a feast of snack food that included cupcakes, pretzel sticks and fruit! Pastor Todd read everyone a story. The biggest hit of the night for entertainment value was the bounce house! The bounce house was blown up in the auditorium because we weren't sure if it was going to rain or not. The children's eyes lit up the moment they walked into the auditorium to see that big bounce house. The evening did exactly as it was created to do. It gave an opportunity for families to have community with not only the people in their family but also other families. The evening was driven by serving a loving and gracious God that we want to teach our families here at Summit to worship together. Giving the chance for parents and children to worship hand in hand. At Summit Church we believe gospel community is the primary context for discipleship, because discipleship happens best in life-on-life relationships. This is where Home Groups shine! Four years ago Ryan & Cassidy Willis decided to open their home to like minded people at Summit Church in an effort to follow through with Summit's beliefs in a gospel community. In the four years since beginning the Willis Home Group it has grown to host seventeen adults between the ages of 24 - 40 and ten children between the ages of 7 years - 3 Months. Home Groups are centered around Christ and focus on becoming closer to Him with others doing the same thing. Growing in the love of Christ and in His Truth with others creates a bond that isn't easily broken but is easily pushed outward and having this allows the group to become your people, your church. Not only does the Home Group gather every other Monday evening they also gather to celebrate each other's successes, babies, birthdays and holidays. They are not only centered around Christ but community as well. Community is the context of a disciple and as a church we are here to make disciples for the glory of God. Go Serve Day on May 20th, 2017 stood as a day for Summit Church to reach out to our communities and serve those in need. On this day our people, young & old, singles & families, went to several locations to do different jobs. Locations like Oklahoma City Dream Center, Food & Shelter Village in Norman, Tri-City Hope Center, Eden Clinic in Norman, Vida Victoriosa in Oklahoma City and four Summit Church members houses. All of these locations were in need of physical labor, people to show love and assistance. 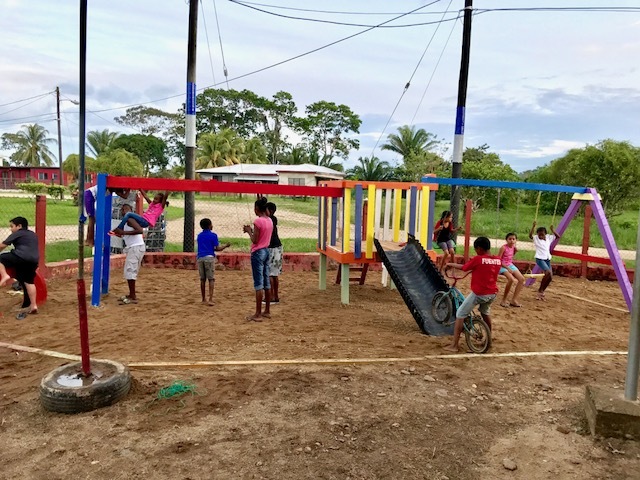 Because of Go Serve Day children got to spend a day having fun outside, walls were erected, houses and yards were cleaned and so much more! At the Eden Clinic the volunteers painted, picked up trash and cleaned weeds out of the flower beds. Not only were people able to give what each location was asking for but because the day went so smoothly they wanted to do more. At the Oklahoma City Dream Center four volunteers framed out a wall with the help of a carpenter. They took a very large room that was underutilized by the church to turn it into two rooms. One side will be storage for the church the other side will serve as a "living room" where they bring people out of service who are interested in hearing more about a relationship with Jesus and being baptized. Our volunteers also served widowed members of our church. These women needed help in their yards that might have otherwise not been able to be attended to. December 17th, 2016 fifteen men and women started their week long adventure in the mission field. Because of its proximity to the United States and the fact that you do not need passports to travel there, Puerto Rico serves as a perfect first step into the world of international missions. It is located in the northeastern Caribbean Sea, east of the Dominican Republic and west of the US Virgin Islands. Praying Pelican Missions (www.prayingpelicanmissions.org) is a short-term international missions organization serving the needs of indigenous local churches, pastors, and communities around the world. This group of people worked alongside people that live and work in the community. The group joined in on the work God was already doing through the people of Praying Pelican Missions. Our Puerto Rico team spent the week at Iglesia Methodista San Pablo (St. Paul Methodist Church) in San Juan, Puerto Rico. In the mornings they spent time working on painting murals, installing air conditioning units, organizing donations and whatever else the church needed. In the afternoon they spent time sharing the joy of the birth of our savior Jesus Christ by putting on a Christmas themed Vacation Bible School for 25-35 local children. They also helped many members of the community by handing out packaged meals to those that wouldn’t have otherwise been able to afford it and praying for them. Although the language barrier was difficult to overcome our Puerto Rico team recognized early on that God was assisting in their communication in other ways. 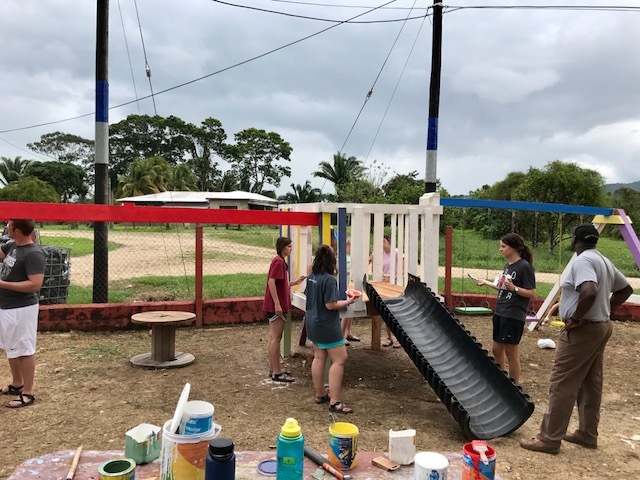 Not only was our team able to help with needs around Iglesia Methodista San Pablo and their community, but the Lord was working in them as well. Kyle & Sam Schasteen along with their eight year old daughter, Maddie, have been members of Antioch Christian Church since 2003. Not only are the Schasteen’s heavily involved with the children’s minsitries at Antioch, Kyle is also an elder. Shortly after Nathan and Todd met for the first time the discussion of the merger began with the elders of both Antioch and Summit. Not only were there fears involving motifs but also there was a concern about the campus as an entirety. Kyle was processing as not only a church member but an elder as well, through what would happen with both the preschool and the academy, Antioch's bylaws, legality, and how the church member’s would feel as well. Through much prayer and guidance from God both Kyle and Sam were able to open their hearts towards God’s plan for both Antioch & Summit. Kyle & Sam, like others, have been through a rollercoaster of emotions since the beginning discussions of a merger. Where fear and distrust could have taken over this plan they sought out God in their decision faithfully.